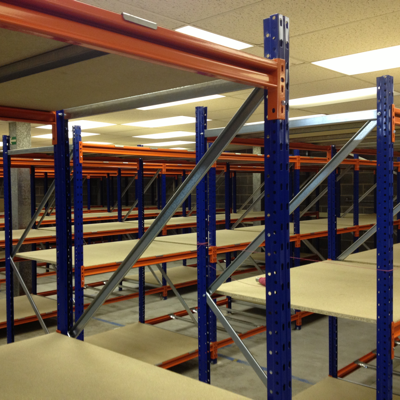 Hand loaded Archives - Shelving & Racking Ltd.
Hand loaded warehouse shelving, or longspan shelving as it is often known, is scaled down version of pallet racking used for storing non-palletised goods. It has the upright frames and horizontal beams of pallet racking, but the beams are a z-profile to support a chipboard shelf. 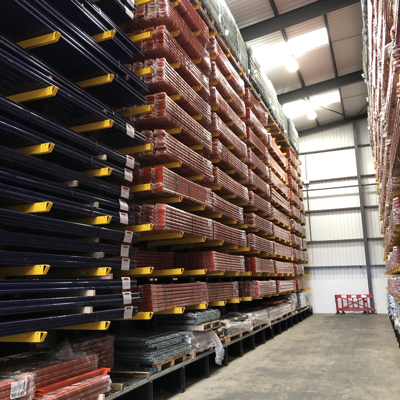 We have large quantities of our QuickSpan shelving system in stock, available for fast dispatch in a wide range of sizes. The upright frames are 2000mm to 5000mm and can be braced at depths from 400mm to 1200mm. All frames are supplied assembled, with footplates attached and including fixing bolts and shims. Beams come in sizes from 950mm to 2700mm and are supplied with beam locks. We have chipboard decks and support bars to suit all sizes of shelving. Dropover steel shelves are also available for this shelving system. The beam height can be adjusted every 50mm on the frames and the load capacity is up to 1075kg UDL per shelf. This makes for a very versatile and fully adjustable heavy duty shelving system suitable for all warehouse and industrial environments. Call us now on 0800 612 3210 to place an order or to discuss your hand loaded warehouse shelving options. Alternatively, send us an enquiry form and we will get back to you quickly.